Summary: We present the MR imaging findings in a patient with symptoms of increased intracranial pressure and a mass in the left lateral ventricle. The mass showed increased signal intensity on T1-weighted images and low signal intensity on T2-weighted images. The histologic diagnosis was that of melanoma, and detailed physical and funduscopic examinations disclosed no evidence of a primary lesion. We believe that the mass was a primary intraventricular melanoma, possibly arising from the choroid plexus, and we discuss the mechanisms that may be responsible for its occurrence in this location. Primary malignant melanomas most commonly originate in the skin, mucosa, and the choroid in the eyes (1, 2). In most instances, melanomas involving the CNS represent metastatic disease. Melanoma is the most common primary tumor to produce brain metastases, after lung and breast cancers (3, 4). Melanocytes normally exist in the CNS, particularly in the leptomeninges (1, 5, 6). The concentration of leptomeningeal melanocytes is higher in dark-skinned persons, with most of these melanocytes found in perimedullary and high cervical regions. Thus, primary malignant melanoma of the CNS may arise from leptomeningeal melanocytes. Despite the fact that most melanomas in the brain and in the spinal cord are metastatic, more than 250 cases of primary CNS melanoma have been reported in the literature (7, 8). Two instances of malignant melanoma arising in the choroid plexus epithelium have been reported, but these patients were not examined with MR imaging (9, 10). We present the MR imaging findings in a patient with an intraventricular melanoma, which we presume to be primary. 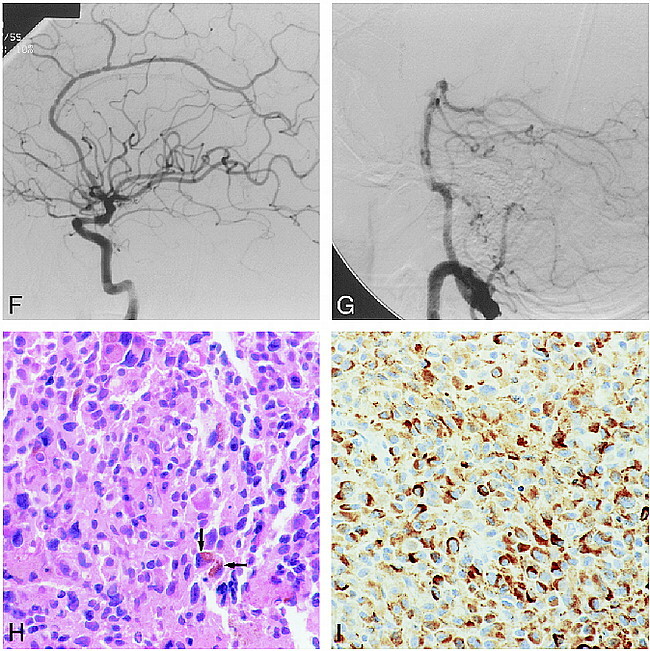 A 48-year-old woman presented with a 2-week history of headache. Funduscopic examination showed bilateral papilledema; the remainder of the physical examination was normal. A noncontrast CT scan showed a hyperdense mass in the atrium of the left lateral ventricle (Fig 1A), the temporal horn of which was enlarged owing to entrapment. After contrast administration, the mass enhanced (Fig 1B). An MR study was obtained on a 1.5-T unit, and noncontrast T1-weighted images showed a 4-cm rounded mass in the left lateral ventricle. The mass had increased T1 signal intensity peripherally (Fig 1C). On T2-weighted images, the mass was of low signal intensity (Fig 1D). There was no surrounding edema or invasion of the parenchyma. After contrast administration, the mass enhanced inhomogeneously (Fig 1E). Catheter angiography showed no tumor vascularity (Fig 1F and G). 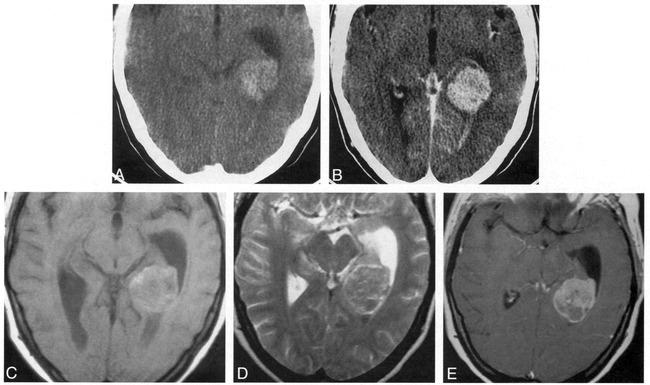 The preoperative differential diagnosis included astrocytoma, ependymoma, subependymoma, oligodendroglioma, and a metastasis. The mass was surgically exposed via a left temporal approach. Upon opening the ventricle, a dark greenish and brown mass was noted and was partially resected. Histologic examination revealed a hypercellular neoplasm composed of spindle and epithelioid malignant cells arranged predominantly in sheets. Focal areas of necrosis and a brisk mitotic rate were present. Scattered neoplastic cells displayed dusky brown intracytoplasmic pigment (Fig 1H). Malignant cells showed a strong immunoreactivity to HMB-45 and were uniformly nonreactive for cytokeratin, glial fibrillary acid protein, and leucocyte common antigen stains (Fig 1I). These findings are diagnostic of malignant melanoma. After the histologic diagnosis, dermatologists undertook a detailed physical examination and ophthalmologists a funduscopic examination; both were normal. The patient decided to transfer to another institution for therapy. At clinical follow-up 3 months after surgery, the patient was stable with no evidence of a primary melanoma on physical examination. 48-year-old woman with a 2-week history of headache. A, Noncontrast CT scan shows a hyperdense mass in the atrium of the left lateral ventricle. The temporal horn is dilated. B, CT scan after contrast administration shows enhancement of the mass. Although there is a suggestion of ependymal enhancement in the left occipital horn, an MR study was normal at this level and during surgery this region appeared normal. C, Axial noncontrast T1-weighted MR image (570/15/1 [TR/TE/excitations]) shows the intraventricular mass to have a peripheral zone of increased signal intensity and to be slightly inhomogeneous centrally. D, On an axial noncontrast T2-weighted MR image (3600/93/1) (slightly different level), the mass is relatively hypointense. E, Axial T1-weighted MR image (650/15/1) after contrast administration shows the mass to enhance inhomogeneously. F, Lateral view from a left internal carotid artery injection shows no tumor vascularity. The irregularities involving the anterior cerebral artery are of unknown significance, as the patient did not have vasculitis by clinical and laboratory examinations or by MR imaging. G, Lateral view of injection into the left vertebral artery shows no tumor vascularity. H, High-power histologic section (hematoxylin-eosin stain) shows an infiltrative neoplasm arranged in irregular nests of closely packed malignant cells, some of which contain intracytoplasmic melanin pigment (arrows). I, High-power view shows strong immunoreactivity (brown-appearing areas) with the antibody HMB-45, which is the most specific marker for melanoma. These cells are melanocytes. In the United States, melanoma is diagnosed in 32,100 persons every year, and approximately 7200 of these patients die every year as a direct consequence of the tumor (2). Recently, a 12% annual increase in the number of patients with primary melanoma has been reported (2). The most important etiologic factor in the genesis of these tumors is sun exposure, although it does not need to be direct. Nearly all primary malignant melanomas arise in the skin. Within the CNS, melanin is normally found in the leptomeninges (1, 5, 6, 11). This melanin is identical to that found in skin melanocytes (ie, melanosomic or “true” melanin). Melanosomic melanin is different from neuromelanin, which is only found inside neurons. The largest concentration of melanocytes is on the pia surrounding the medulla (particularly ventrally) and on the high aspect of the cervical spinal cord. This melanin may be visible on T2-weighted MR images as areas of low signal intensity, mostly on the ventral surface of the medulla (5). This finding is more commonly encountered in dark-skinned persons and it should not be confused with diseases that contain melanin or iron deposition (such as superficial siderosis). Melanin is not normally found inside the ventricular system. Embryologically, both melanocytes and primitive arachnoid cells arise from neural crest cells (5, 6, 11). Owing to abnormal interactions with cellular surfaces, interstitial molecules, and/or genetic aberrations, melanocyte migration may be arrested and these cells may become deposited in the pia. During brain development, the lateral ventricles arise as outpouchings from the third ventricle. These primitive ventricles (or vesicles) comprise most of the forebrain. In the medial aspect of these vesicles, there is a very thin layer (the future choroidal fissure) on which blood vessels lie on the superficial pia, which abuts the ependyma (immediately below the pia). The choroid plexus are formed from an invagination of these vessels into the ventricular vesicles (12). The choroid plexus are formed by a core of blood vessels surrounded by pia and ependymal cells. These ependymal cells become specialized in secreting CSF and are called choroidal epithelium. Therefore, it is possible that melanocytes initially located within the pia may find their way into the choroid plexus. Melanin results in T1 and T2 shortening because of the presence of stable free radicals within it (7, 11). Unpaired electrons in melanin and water protons produce a dipole-dipole interaction that results in high T1 and low T2 signal intensity. In most reported cases, the majority of primary CNS melanomas were found to arise in the meninges (1, 6–8). Melanomatosis results in a diffuse process involving the leptomeninges, particularly at the base of the skull and surrounding the spinal canal (5, 6, 11). Focal meningeal melanomas are also known to exist. Most patients with primary CNS melanomas are in the fourth decade of life, and specific monoclonal antibodies in CSF are present in 95% of them (6). In our patient, the primary preoperative diagnosis was that of astrocytoma, ependymoma, subependymoma, oligodendroglioma, meningioma, and, less likely, a choroid plexus papilloma/carcinoma. Meningioma and choroid plexus papilloma/carcinoma were unlikely because of the lack of vascularity on the catheter angiogram. We are not aware of any reports of meningiomas containing fat (thus resulting in increased signal intensity on T1-weighted images) and arising inside the ventricles. Although we could not completely exclude the possibility of the mass being a metastatic melanoma, the fact that a primary tumor was not found and that metastases to the choroid plexus are rare, we favored the diagnosis of a primary intraventricular melanoma. Unfortunately, the prognosis for most patients with primary CNS melanoma is poor. In our patient, because of negative skin and eye examinations, we assumed that the melanoma originated within the ventricle. Pathologic confirmation of the choroid plexus as the point of origin for a melanoma necessitates the presence of both choroid plexus and tumor on histologic sections. This was not documented in our patient, probably reflecting a sampling error. Retrospectively, the MR signal characteristics of the lesion were consistent with melanoma; moreover, high CT density has been reported in meningeal melanocytomas. Because we were not aware that these tumors may arise inside the ventricles and from the choroid plexus, the diagnosis of melanoma was not initially considered. ↵1 Address reprint requests to Mauricio Castillo, MD, Department of Radiology, CB# 7510, University of North Carolina School of Medicine, Chapel Hill, NC 27599.